Mark McAllister (right) celebrates finding the net against former club Linfield with, from left, Darren Murray and Michael Gault. Pic by PressEye Ltd. It was a tale of two penalty kicks as Portadown threw away a vital point at Windsor Park on Saturday. Linfield’s Aaron Burns blasted a 49th-minute penalty against the crossbar and with referee Raymond Hetherington failing to spot it had bounced two feet over the line, it was left to a linesman to award the goal – rightly as it turned out, as shown on a video of the incident. That levelled the scores at 2-2, and Sammy Morrow slammed home a great third seven minutes later when a five-man passing move saw him convert a final pass from Ivan Sproule. The Ports were handed a lifeline in added time when Jimmy Callacher chopped down the Ports’ top man Mark McAllister - but chief penalty takers Darren Murray (substituted) and Chris Casement (suspended) were not on the pitch. So it was left to Ross Redman to have a go. But being left-footed and largely untested at spot-kicks, he whacked it to Ross Glendinning’s left. The goalkeeper guessed brilliantly and not only stopped the shot, but held it. And so the Ports’ legions filed out of the Spion Kop stand, frustrated as ever on trips to Windsor Park. 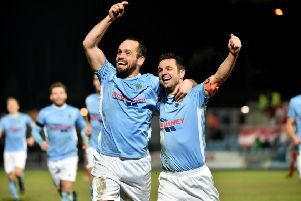 For records show that the Blues haven’t lost a ‘home’ league match to Portadown since 2002 – 18 outings where the Ports have managed just five points from a possible 54. It looked as if that unenviable record would remain intact after just two minutes when a Burns cross skipped off a Portadown head and Callacher – unmarked at the far post – headed into an unguarded net. But Portadown were ‘up’ for this one and were deservedly 2-1 up by the break. The first, on 29 minutes, was down to a Glendinning faux pas when the keeper palmed out a Peter McMahon effort and in bustled Sean Mackle to force the ball home. Three minutes later, the Ports scored a classic. Robert Garrett sent Redman away on the left and he crossed it for McAllister to flash home a header that left Glendinning rooted to the spot – and that wasn’t long after another McAllister header had troubled the crossbar. Linfield, though, rallied in the second-half and a combined Michael Gault-Redman tackle flattened Sproule and the Ports furiously questioned the goal – especially as the ref had failed to spot it. And then came the Blues’ winner and the penalty anti-climax that left fans wondering why ace striker Gary Twigg didn’t step in and take the penalty. Ports manager Ronnie McFall flayed the officials, asking why referee Hetherington failed to spot that penalty goal, and why he booked five Ports players and just one Blueman. He fumed, “This was a crunch match with both teams at the top end of the league and the officials had a nightmare. PORTADOWN: David Miskelly, Chris Ramsey, Ross Redman, Garry Breen, Peter McMahon, Sean Mackle, Darren Murray, Mark McAllister, Michael Gault, Robert Garrett, Jordan Lyttle. Subs: Billy Brennan, Matt McMahon, Shea Conaty, Tim Mouncey, Gary Twigg.